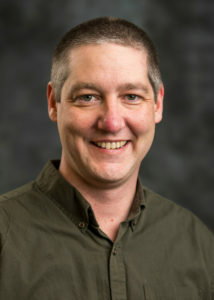 Tim Arner, Associate Professor of English. staff and faculty headshots Jan. 31, 2018. On Grinnell College Week: What does the art on your walls say about you? Timothy Arner, associate professor of English, discusses this question. Tim Arner specializes in medieval literature. His research and teaching interests include the writings of Geoffrey Chaucer, the influence of classical texts on Middle English poetry, and the intersections between fourteenth- and fifteenth-century literature and politics. He has published articles on Chaucer’s “The Miller’s Tale” and Troilus and Criseyde, and he has presented papers on Lucan, Chaucer, Lydgate, Spenser, and Shakespeare. Recently, Tim collaborated with a group of students to produce The Grinnell Beowulf, a translation and critical edition of the Old English poem. Tim is currently working on his first book project, Trojan Wars: Genre and the Politics of Authorship in Late Medieval and Early Modern England, which examines the rewriting of the Troy legend in England from Chaucer to Shakespeare. He received his B.A. from The American University (2000) and his M.A. (2002) and Ph.D. from The Pennsylvania State University (2006). As you enter the Queen’s Robing Room in the Palace of Westminster, to your right hangs a painting titled Generosity that shows Britain’s legendary King Arthur lying on the battlefield as his best-friend-turned-enemy Sir Lancelot stops another knight from slaying the defeated monarch. Further along the west wall is a painting titled Religion, in which Christ and the evangelists appear to Sir Galahad and his fellow Grail-seekers. Among the group of men adoring Christ is a woman in blue robes wearing a small crown. She is Percival’s sister, and, according to Sir Thomas Malory, she is not supposed to be there. The last painting, called Courtesy, shows Tristram playing the harp for his beloved Iseult, who is married to his uncle, King Mark. Given the tragic story of this love affair the title seems ironic. The Robing Room is a private chamber where Britain’s monarch prepares to deliver the State Opening of Parliament. It is decorated with frescoes and woodcarvings depicting episodes from the Arthurian Legend. While the art is meant to celebrate noble virtues, it also reminds us that the legend of King Arthur is a story of adultery, betrayal, and treason. Traditionally, much of the blame falls to Queen Guinevere, who is featured in the painting that hangs to the right of the door as one leaves the Robing Room and prepares to enter the House of Lords chamber. To what extent might Queen Victoria have identified with King Arthur or with Guinevere, and what does that say about her sense of herself as a queen in a patriarchal political culture? While we can only speculate about how Queen Victoria interpreted the room’s Arthurian paintings, we can demonstrate the artwork’s particular relevance to a female monarch who may have seen herself in/as both Arthur and Guinevere. We believe that public concerns about Victoria’s gender, sexuality, and authority — concerns privately shared by the Queen and her husband – provide a necessary context for understanding the Robing Room as a site of Victorian Arthuriana.